Everyone of us tries so hard to make our home more livable and pleasing. Not just we organize our stuffs but time to time we decorate our homes during different seasons of the year. We enjoy it a lot and of course the little ones find it amazing to have a house with lots of attractive decors. To begin with the hearts for Valentines, eggs for Easter, blue and red theme of the 4th of July, pumpkins on Halloween and the grandest season ever, Christmas Day! 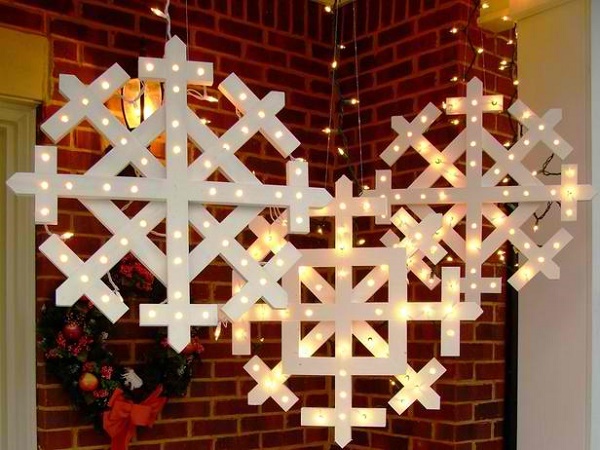 Luckily, this yuletide season have lots of symbolic figures and items giving us the chance to choose from tons of decoration ideas. Mistletoe, snowflakes, gifts, snowman, Santa, bells and ribbons everywhere! Oooops, let’s not forget about the brightest star that guided the three wise men for them to find where Jesus is. 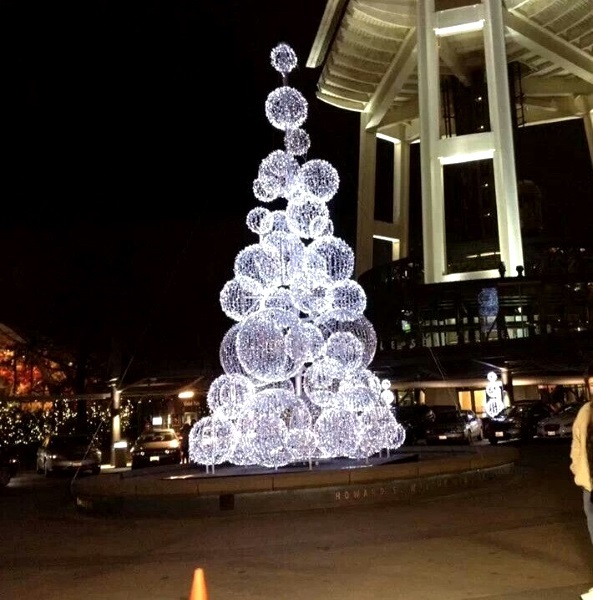 The very reason why the star is the most famous Christmas tree topper. 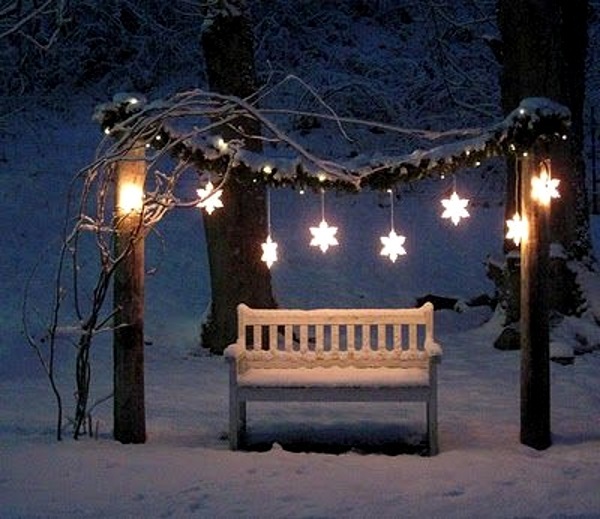 Who doesn’t like stars by the way? We love how they blink and shine. I guess that exactly explains why people sees to it on having Christmas lights all over their house during the holiday season. The more, the merrier. If you think you’ve had it dull and common, well you just found the right place to give your decorating task a little twist. 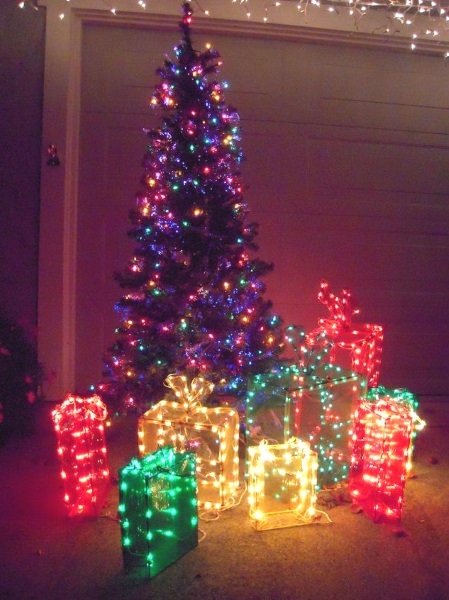 This is a collection of projects, crafts, ideas and other options on how to use our ordinary Christmas lights. 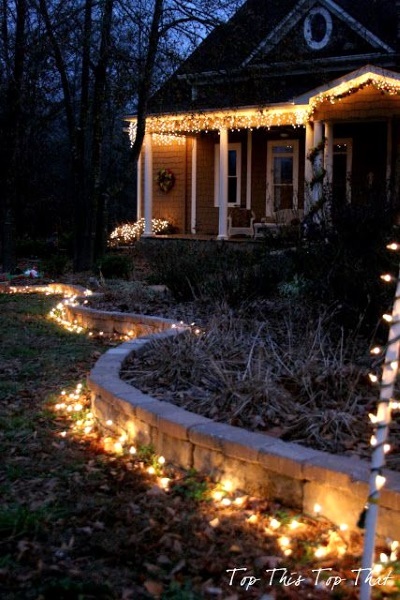 The Best Outdoor Christmas Light Ideas for you and for me. Some very unique, creative while some are simple yet still very beautiful. Only the best projects shared by generous people. Let your husband/wife and kids join you in this activity and have fun browsing! 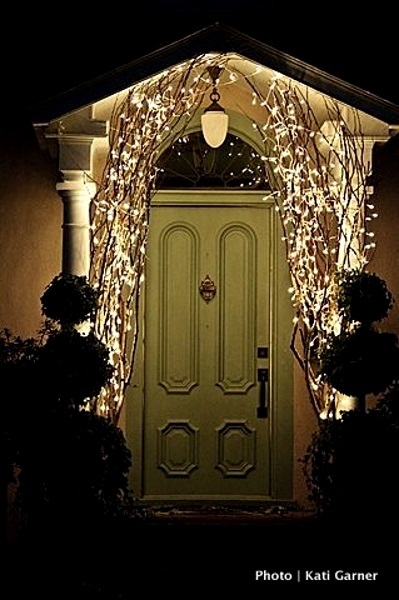 Aside from the Christmas Door Decorating Ideas I’ve listed here, make it even more magical by decorating your porch with these lighted projects. 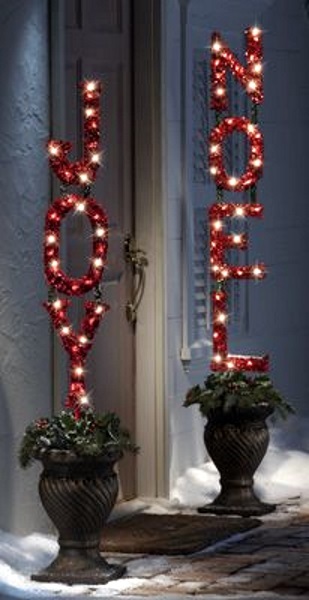 JOY and NOEL Christmas decorations. JESUS would be perfect too! 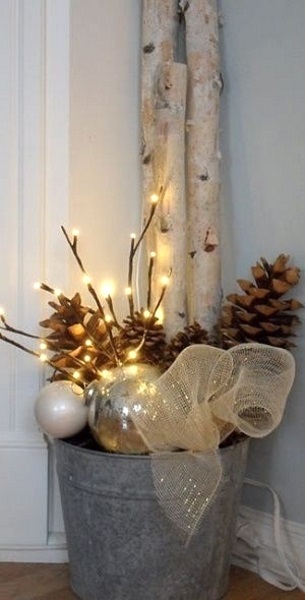 Do you have extra pine cones and ornaments? 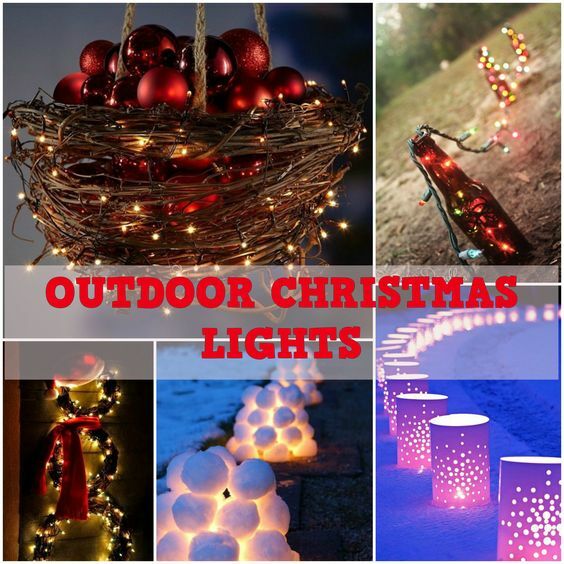 Fill a bucket with these items for a rustic outdoor Christmas decoration. 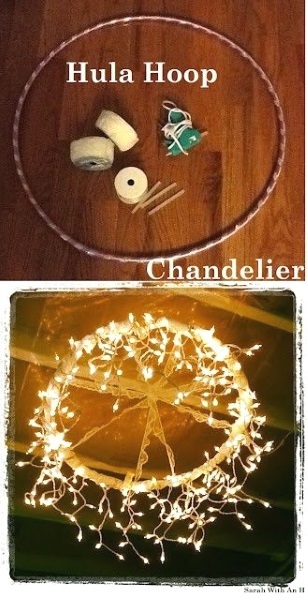 Borrow your girl’s hula hoop and turn it into a DIY Christmas Chandelier. Beautiful! Do you have worn-out umbrellas? 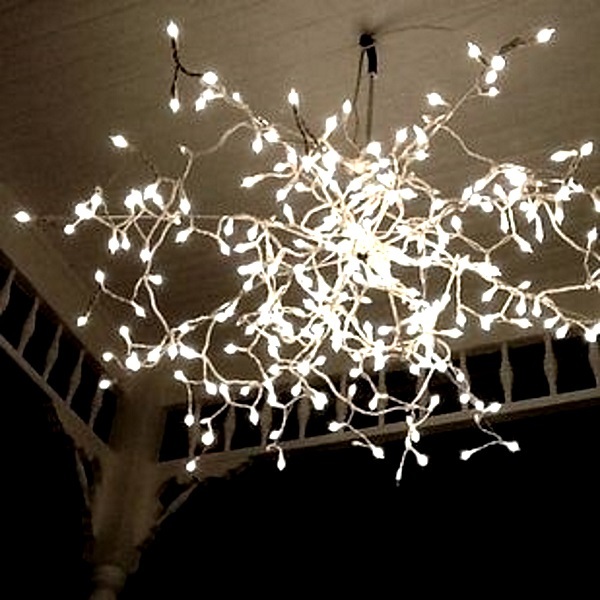 Yup, this is actually an umbrella skeleton and twirled with string lights. 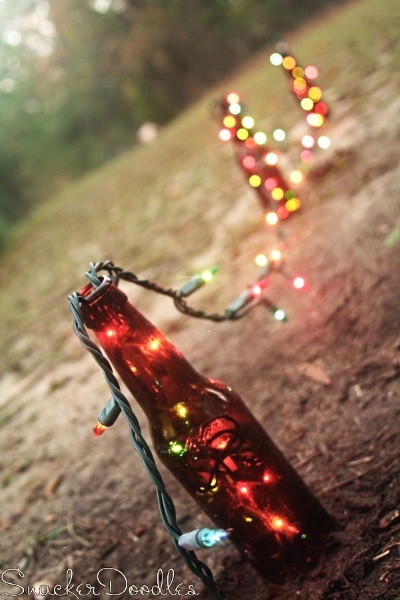 An easy DIY Christmas lighting decoration. 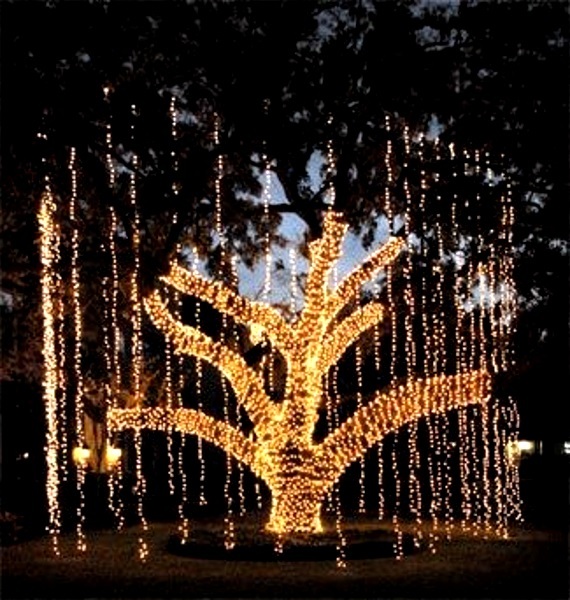 Those are tall branches accompanied with string Christmas lights. 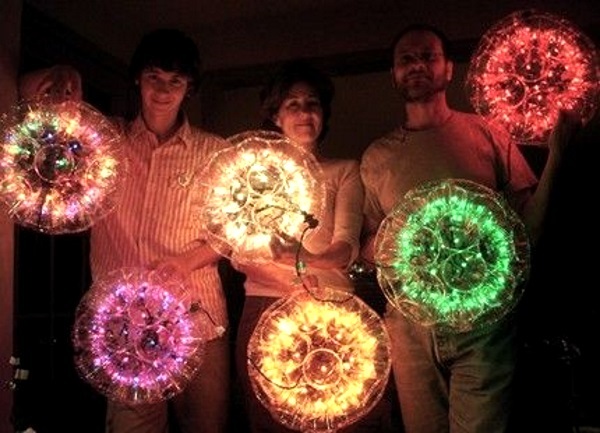 This family did this Christmas light project together. Too sweet! 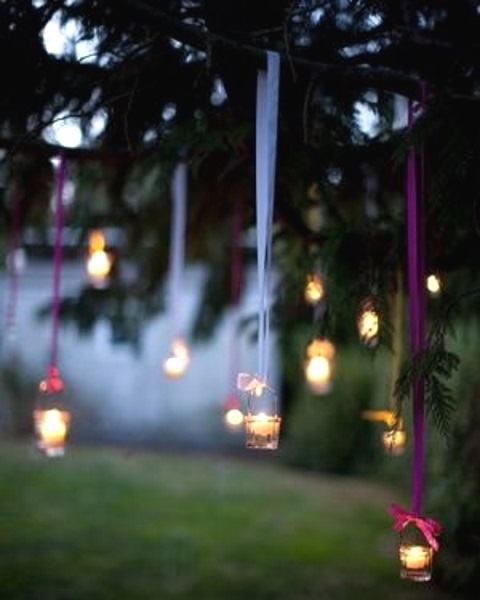 Hanging lighted items are lovely for trees. 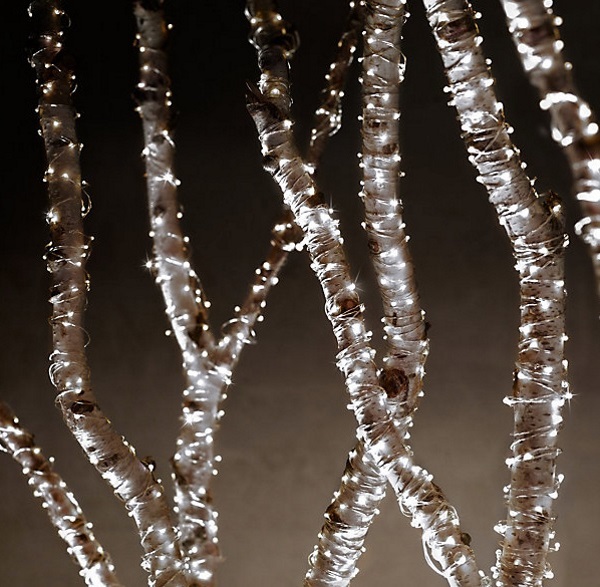 These hanging candles are out of my expectation. Just indeed a bright idea! 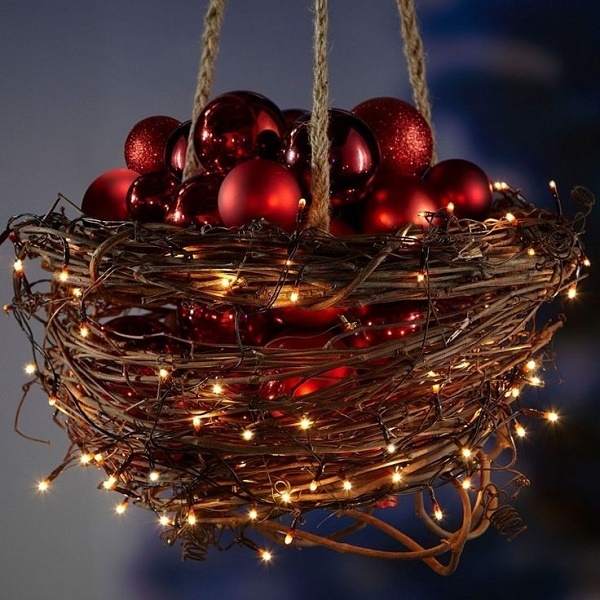 Fill a basket with your Christmas balls. 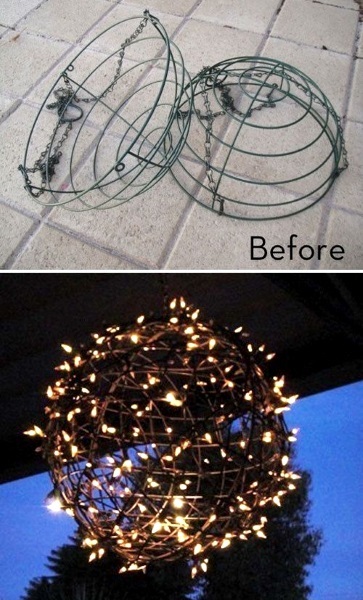 Wrap a string light around the basket. 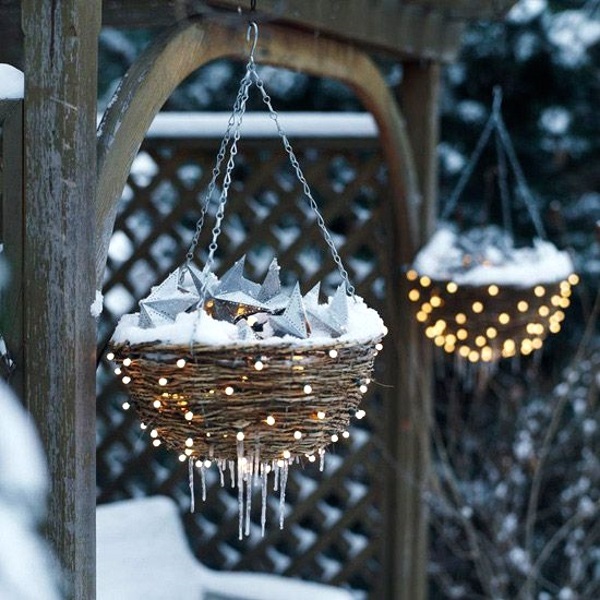 This hanging ornaments planter will make your outdoor very attractive. 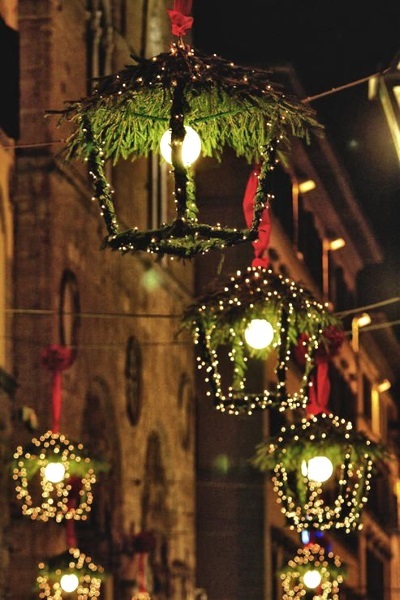 I’d love to see blue with light blue ornaments for this idea. 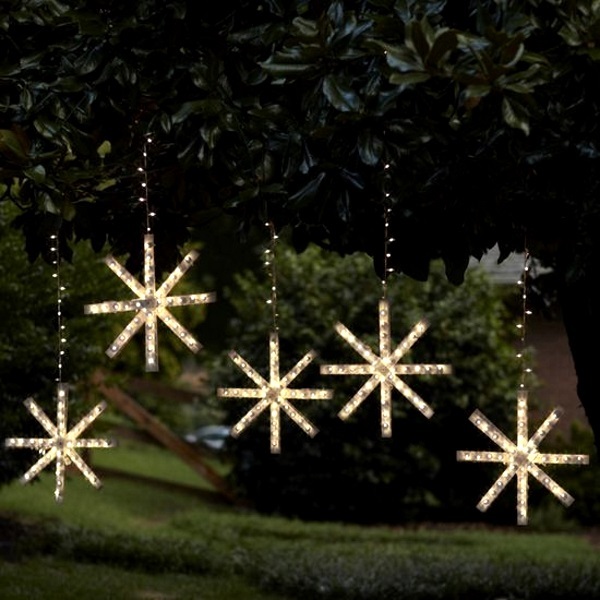 Same as the idea above, but the ornaments are stars. Though, the color picked is quite pale for a Christmas decor. The best Christmas hanging decoration so far. It looks so natural because of those pine vines. 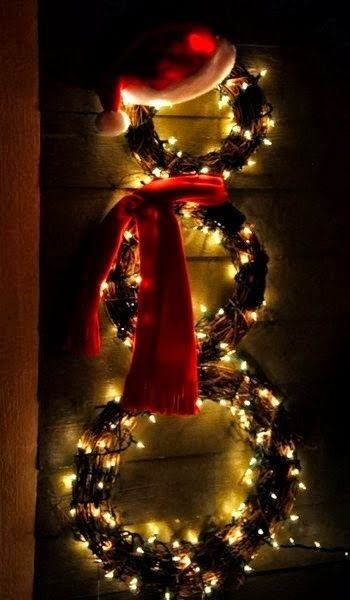 This would take more time, but if you have it then do it as your Christmas decoration this year. 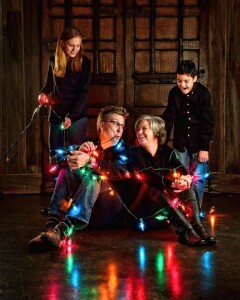 Whatever we use Christmas lights for, they will always have that magical output. So do you plan to dine outdoor? 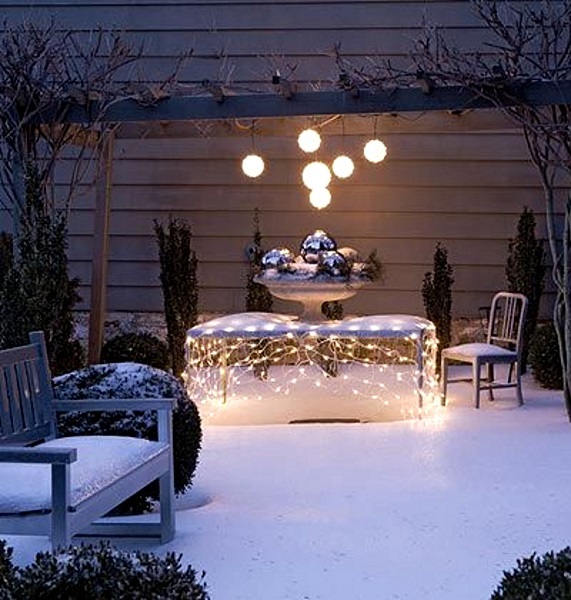 Place some lights under your table making the place really inviting! 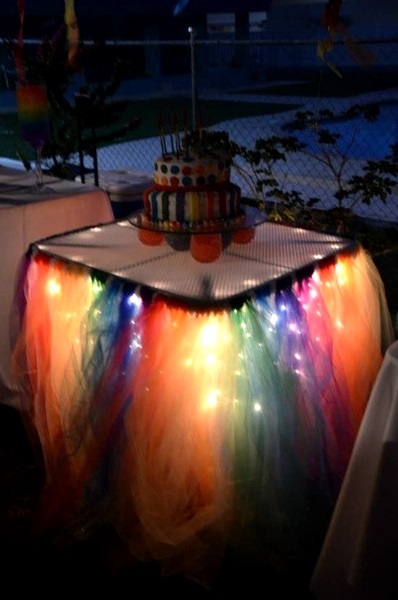 Or if your try this with those ball lanterns hanging above your table! 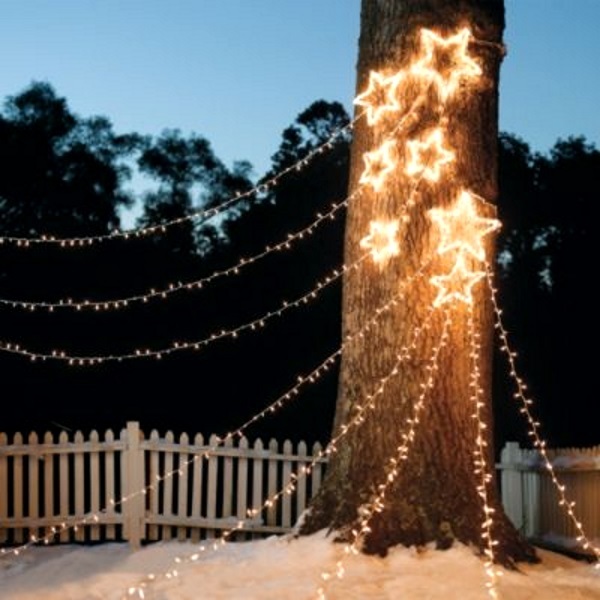 There are just lots of way to set up an outdoor Christmas tree using string lights. Some just hang it from the top to the bottom like this first sample till all sides are filled with lights. 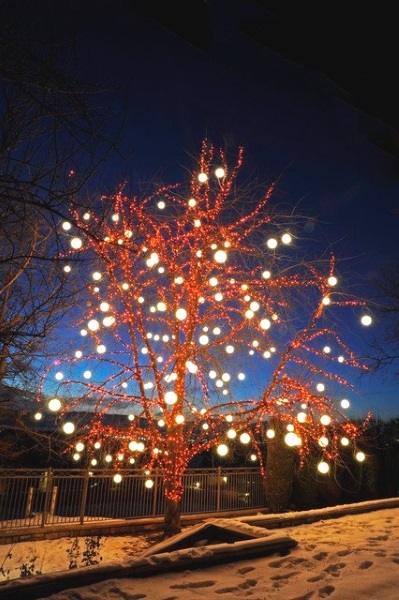 Some would do a tree-shaped fence then twirl lights around it. This one’s a simpler sample for this project. This one’s ideal for commercial areas like malls, offices, halls or if you can afford then why not. 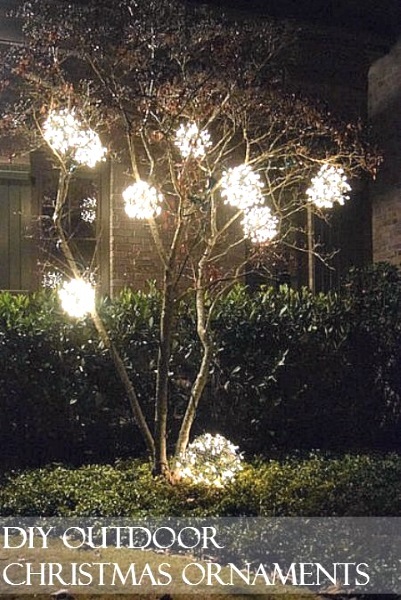 A beautiful Christmas Outdoor Lighting idea. 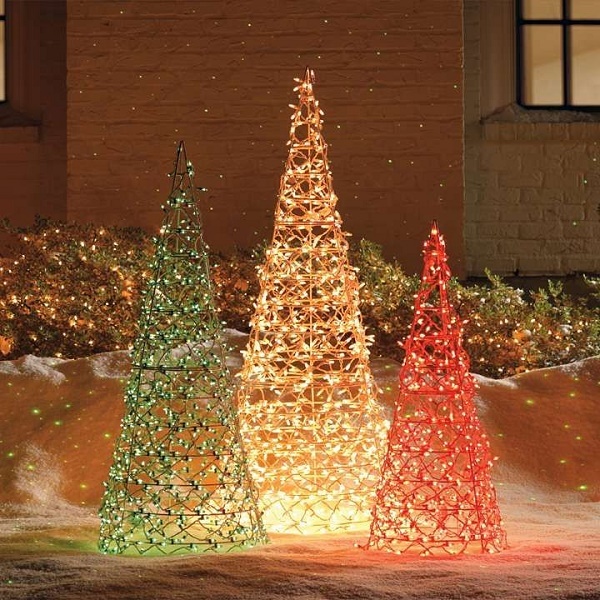 Here’s a tree set outdoor. 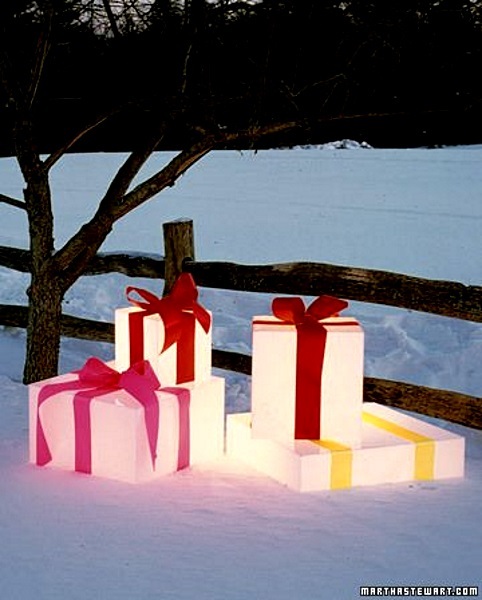 Then the gift boxes are lighted. 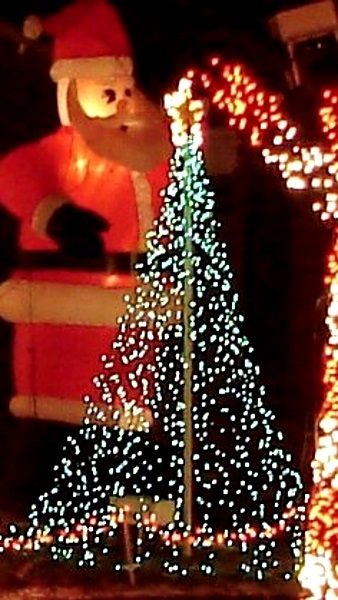 Here’s Santa Christmas Lights on the wall. I’m actually confuse if it’s really Santa because the patter tells me it’s Frosty the snowman. Ahhh this one! I’m sure it’s Frosty the Snowman! 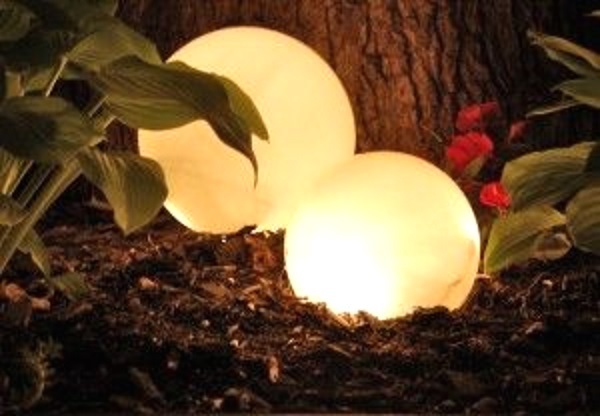 Go purchase for different sizes of Styrofoam balls. Get some vines, a hat and a shoal for him to use. 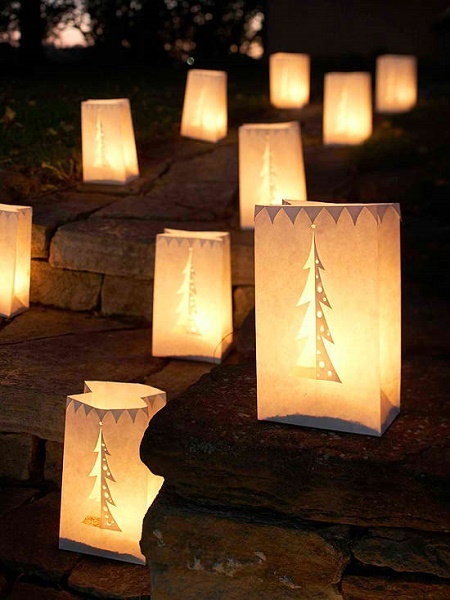 Hang some Christmas lanterns on your mini park, swing or yard. 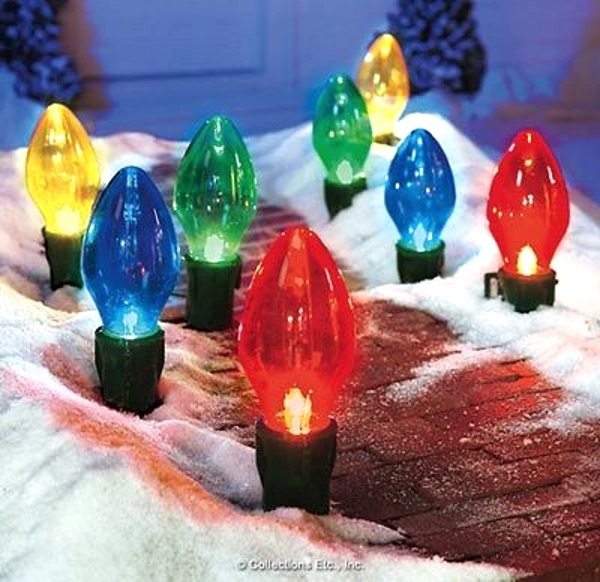 Stand some posts and wrap string Christmas lights around it. 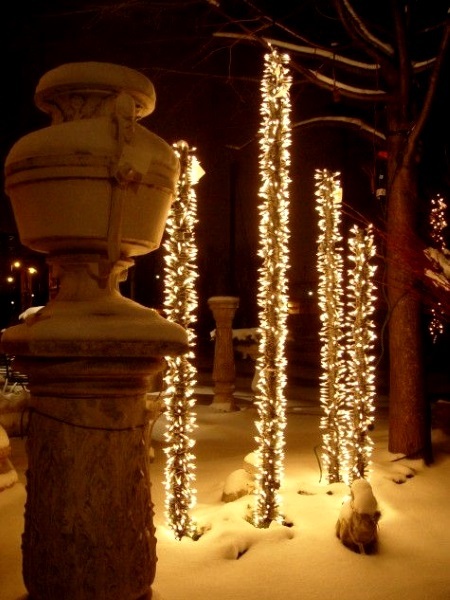 They look like towers of lights! 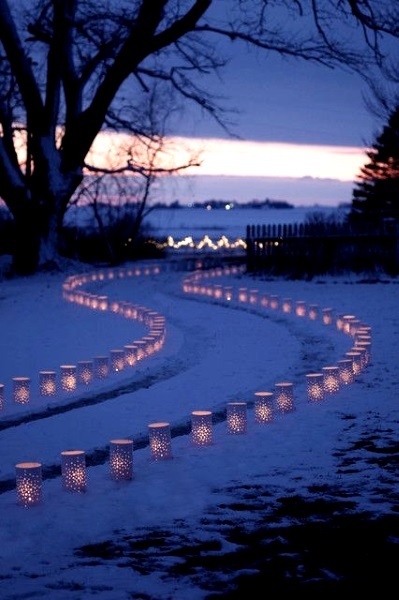 If you wanted it simple (oh I still find this simple), they just put string lights following the track of your pathway. 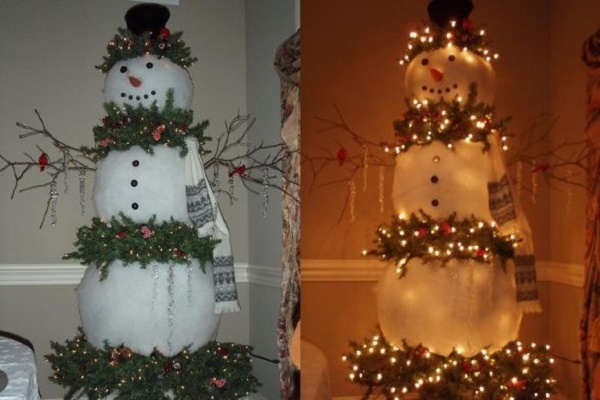 One is cute, but if you have more and connect one tree to another, they actually look pretty awesome! 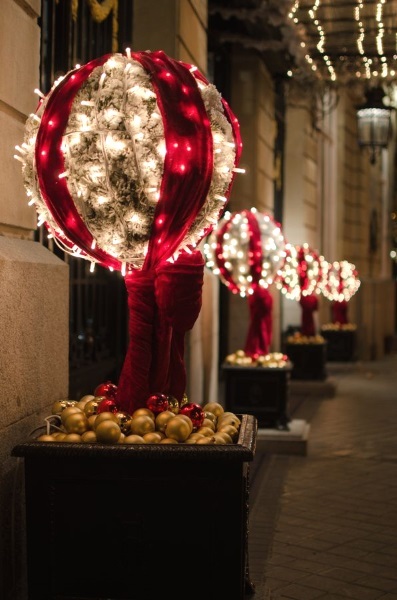 There, the Christmas balls looked like fruits the tree bear. 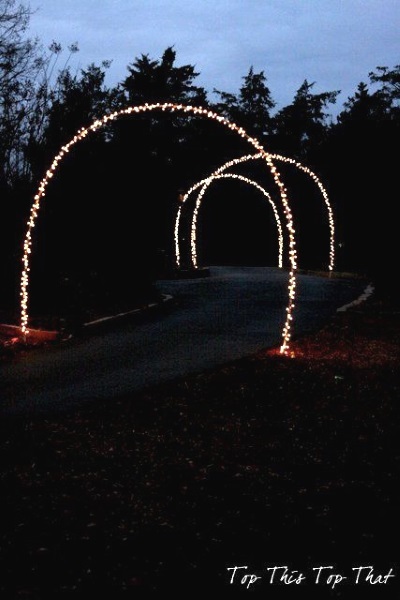 Christmas lighting ideas like the above and this one below are ideal for commercial places like malls and also for parks since it would cost really expensive. 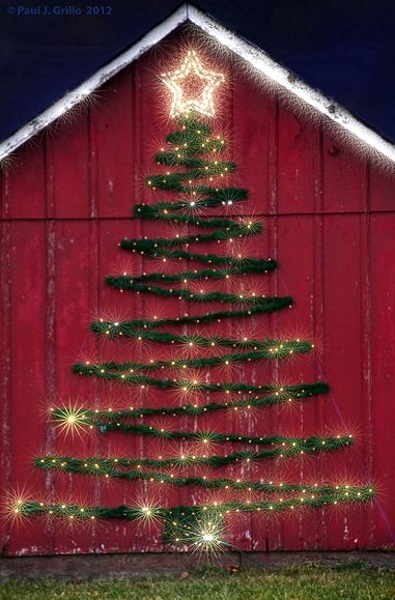 Wrap string lights to your trees like this one. 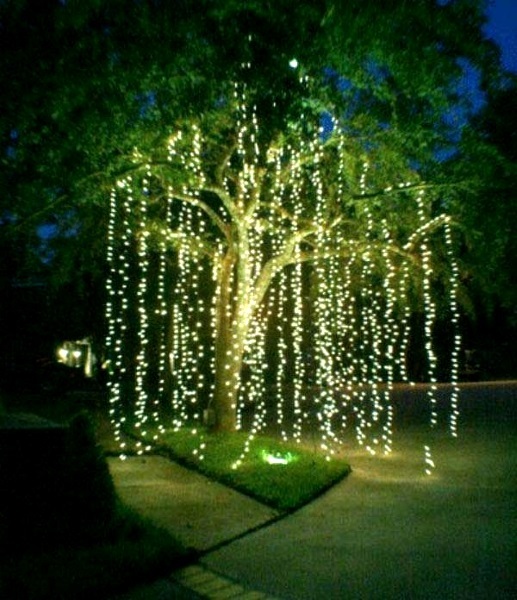 Just hang your string lights like the tree is raining lights. 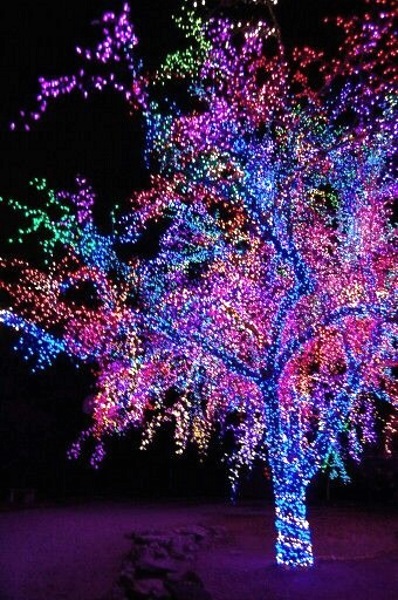 The entire tree is magical!!! 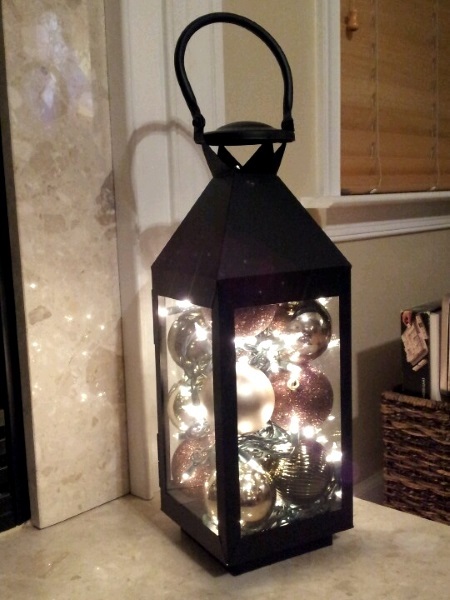 Do you have round lanterns? 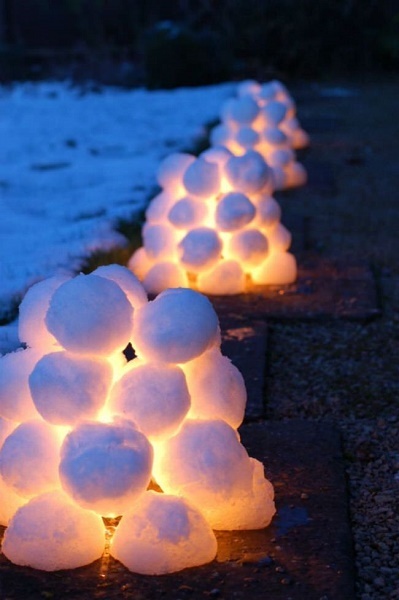 Place them anywhere on your yard for the Christmas spirit to fill your outdoor. I want to see something like this in out park, please! 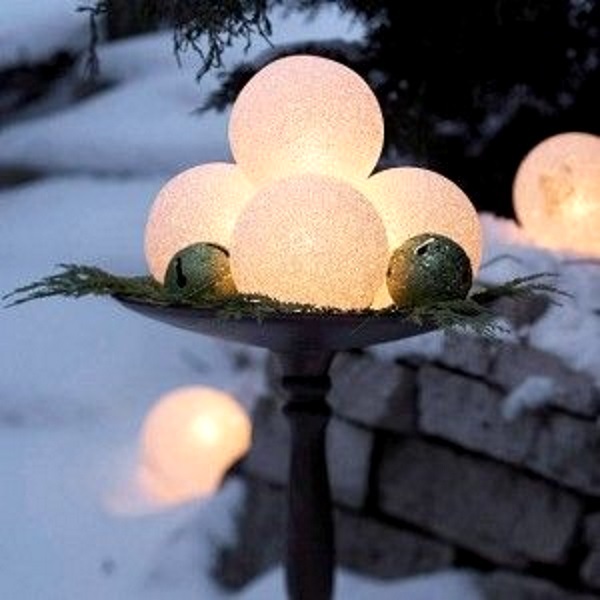 This lighted balls looks good as fence or vase topper. Minimal budget? Go gather some empty bottles. 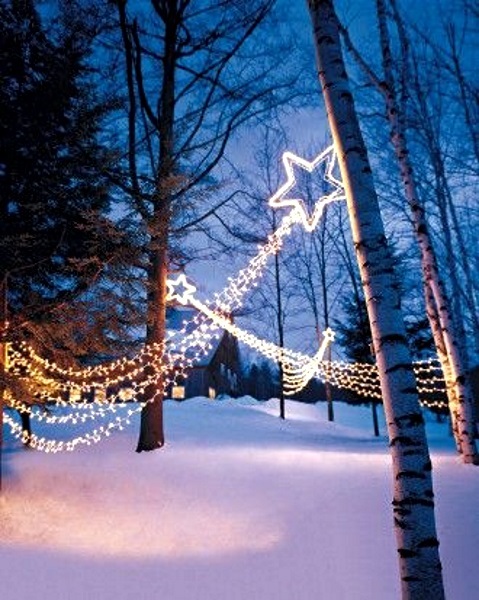 This Snow Christmas lights are my dream project this year! 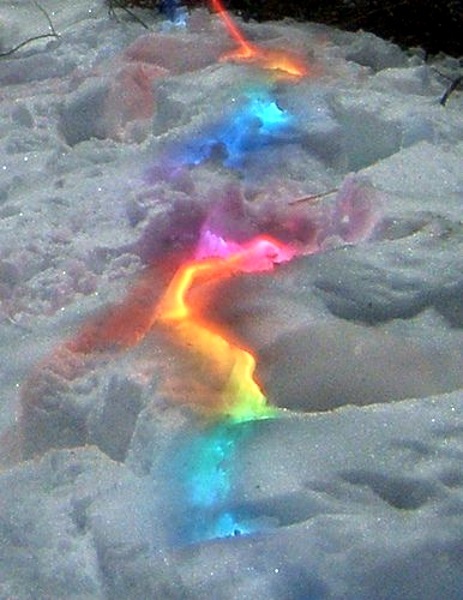 Glow in the dark under the snow. 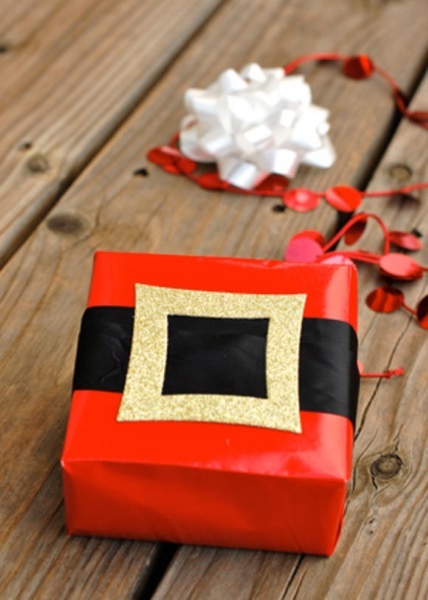 Go on, amaze your kids with what you can do for Christmas 2015! Candles are risky so I suggest you use led candles that costs less than a dollar on Ebay. Here’s a closer look. 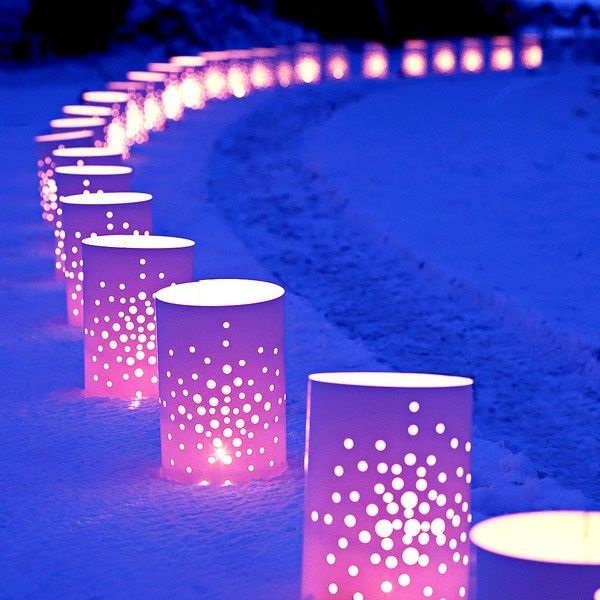 DIY Pink Christmas lanterns! I love it! 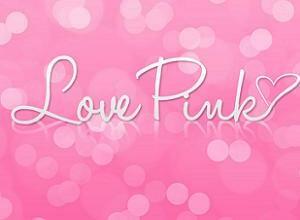 Light + pink is too much joy for me!! Did you enjoy this collection? 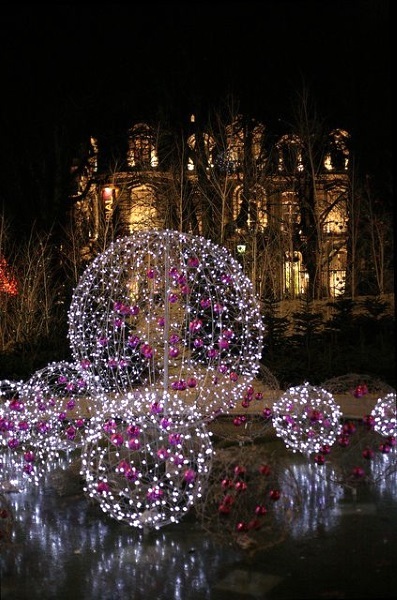 If yes, don’t forget to check our our Best Indoor Christmas Lighting Ideas and I assure you that you won’t regret. 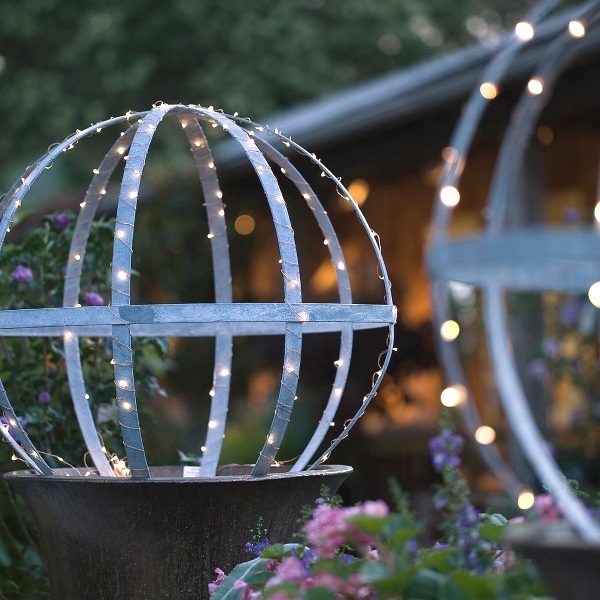 From the easiest DIY projects to some that are more complicated yet really eye-catching. Don’t hesitate to tell your friends about this collection. 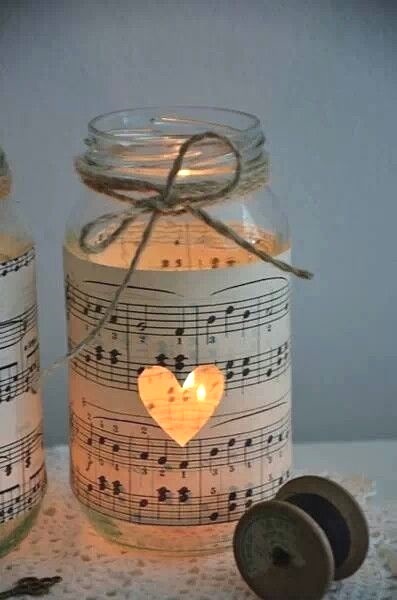 Share the love and the light– i mean the light ideas! Merry Christmas ahead!